Are you having challenges developing probiotic products? With increased consumer scrutiny over product claims, creating probiotic supplements that stand out from the crowd often proves a real challenge. A stable and efficient delivery system is critical to retaining a loyal customer base. Putting product performance at the heart of communications can also help brands to win more consumers, and even extend into new markets and applications. 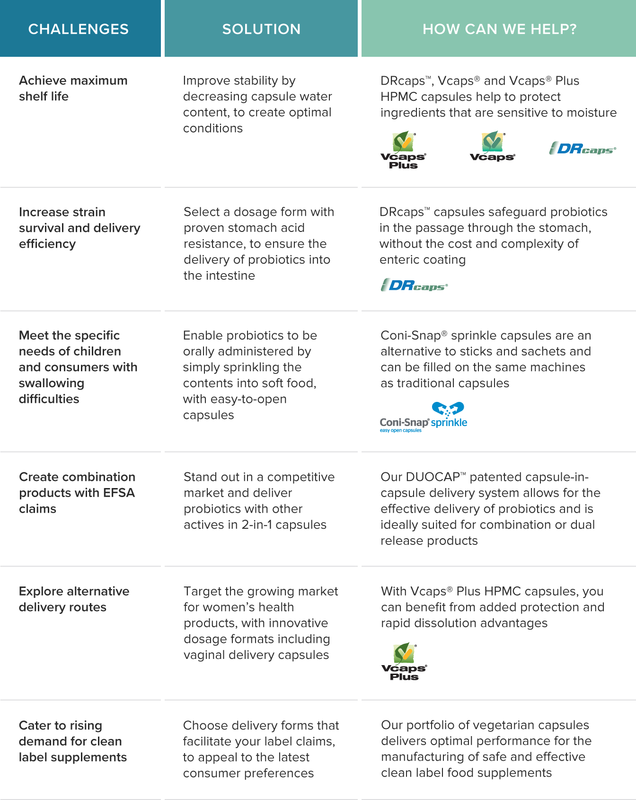 As a global leader in delivering high-quality, innovative dosage forms and solutions, Capsugel brings the formulation answers you need to achieve commercial success. For the past decade, we have been working to overcome the traditional challenges associated with formulating probiotic products. Would you like to learn more about how Capsugel can help you to meet your technical or marketing goals? Choose from the challenges in the image below and discover which product will give the desired functionality.